Midnight is my walking companion. Almost without fail, he's there waiting for me the minute I step out the door. He grins (well, as much as a dog can grin) and wags his tail, "Walk with me?" Most of the time I'm happy to go along. However, sometimes I have excuses. "Sorry, Midnight, I can't go now. You see, I don't usually walk on Saturdays. Besides, I slept in today, and it's so hot now. I'm only outside because I'm on my way to the guest house to take a shower. You see, our water heater's broken and dad's not home to fix it..." Midnight doesn't understand. His tail droops when I go inside the door, and he wanders off elsewhere. The next day, I have a similar excuse. He bounds over when I walk out the door, but again, I tell him that I don't usually walk on weekends. I'm only out this Sunday because I happened to wake up before my alarm and decided to pick blueberries. He starts off eagerly each time I move a little down the row of bushes, looking back to see if I'm following him up the road. Even on weekdays I sometimes have excuses. "It's too hot now; I slept past my alarm." "Sorry, Midnight, this day is just too busy. Tomorrow, okay?" I give him an extra moment of petting, as if that will make up for it. The amazing thing is, he keeps coming back morning after morning, not discouraged by the days that I miss. Other days are like today; good temperature and the perfect time to walk, an energizing start to a productive day. I walk out the door, my verse binder and letters to mail in hand, and he bounds over with the wagging invitation. "Yes, Midnight, let's go!" As I walked this morning, I thought about how my excuses to Midnight are similar to the excuses we sometimes give God. "Sorry, Lord, I know I'm not spending much time with You this morning, but you see, today's really busy; I've got to start on my overflowing to-do list." Or how about this one: "I don't remember turning my alarm off; I slept too late. I'll read a chapter and pray a few sentences, but I've got to hurry through." Other times, it has to do with the day: "I know it's Sunday, but I'll spend more time with You in church later. Right now I've got to get dressed and make myself presentable to..." what? Meet with God or impress others? Yet, God is ever faithful. He's always there even when we ignore Him. He never leaves or forsakes us, but His Spirit is grieved when we won't take time to truly spend with Him, to get to know Him, to walk with Him down the path He's given us. It's my prayer that I won't be full of excuses when it comes to spending time with my Savior. Each day is a new adventure of learning and growing in Him. And, I look forward to continuing my morning walks as well. For though I'm walking with my dog, it's also a time to walk with God. 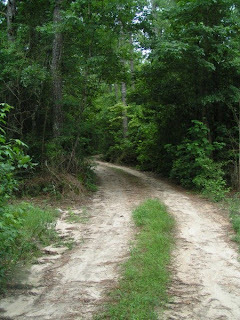 Down the dirt road and back, I memorize His Word, talk to my Faithful Friend, and enjoy the beauty of His creation. These walks are something I won't forget. Anna, as always, that was something that I really needed to hear. My devotions are in the evening, so it's much too easy to say "Oh, Lord, I shouldn't have stayed up that extra half-hour watching a movie; I'll have to hurry and get to sleep if I'm going to get up early tomorrow ..."
Thank you for reminding us that our devotions are fellowship time with God, not just a task to cross off our to-do lists! Thank you for the reminder, Anna! It is always so easy to put off the important things. I was so sad while reading this story. I felt so bad for the dog as I am a huge animal lover. I realized that somewhere inside me I felt worse for the dog than for God! Of course, I know this is wrong thinking, but it's easy to fall into. Thanks for another great post! Your post is so very true, it's very easy "put off" spending time with God. Thanks for sharing! Julie: Yes, I feel sorry for Midnight too when I don't go on a walk with him. However, he can walk by himself - we live in the country and he runs free - so it's not like I'm depriving him of exercise. :) It's just the companionship, which we both enjoy!